Da Vinci was a forerunner in the Earth sciences. He observed natural phenomena as both an artist and researcher, perceiving them with the eye of a painter, but analysing them scientifically. The universal genius was also one of the first to take interest in mountains and see them as natural laboratories. Shells and fish, lodged in stone at 2 000 metres altitude, fascinated scientists in centuries past. Today, the fossils contribute to our knowledge on the upthrust of the Alps. And researchers continue to be fascinated by the footprints left by dinosaurs millions of years ago. Two names, Buache and Humboldt, marked the history of the Earth sciences in the 1700s and 1800s. Each in his own way and using radically divergent methods, they proposed an overall view of our planet in which mountains played a central role. The Alps were scaled back to a simple, rather secondary mountain range among others. However, particularly for Humboldt, they continued to serve as a model. Dolomieu-Dolomites. Nowhere else on the planet does a mountain range bear the name of its « discoverer ». 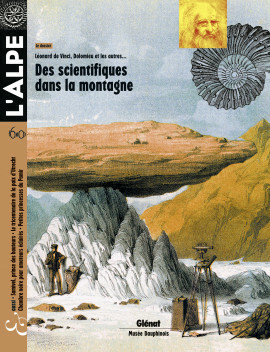 But it must be said that Déodat Dieudonné Sylvain Guy Tancrède de Gratet, born in Dolomieu (Isère, France) at the foot of the Alps, was one of the great founders of modern geology. A tireless traveller and scientific adventurer, he criss-crossed mountains throughout his life in order to tell their long story. Science and art come together on glaciers. Old paintings and illustrations provide modern researchers with valuable information on changes in glaciers over past centuries. This remarkable meeting between art and scientific rigour has produced a beautifully illustrated book from which this chapter is drawn. Photographer Bernhardt Edmaier sees the Alps as both an artist and a geologist. He has flown over them and spent time examining them to discover their birthmarks and the signs of their vitality, and to reveal their intimate structure in their folds and flows. He shows us millions upon millions of years of history in the thousand plates of a handsome book recently published by Glénat. The old lady is 100 years old in 2013, but has in the meantime traded in her old, rather formal garb for a more attractive attire. Her perception of the Alps and other ranges around the world has changed over the 100 years, in step with society and geographical research. Alpine vegetation is organised in altitudinal zones, a fact learned in school and an easily observable phenomenon. However, behind the concept is a complex reality based on combinations of plants and the subtle exchanges between them. How will these « communities » react to climate change ? Museums and discovery centres, informative trails and mysterious caves, from Nice to Vienna and Geneva to Ljubljana, here is a selection of the most beautiful Alpine sites to better understand the articles in this issue, when you will be out on the slopes. A book published by Glénat, with the Ethnographic museum of Geneva, proposes a new look at the very different and very secret artist. A selection of lesser known works and great classics, commented in detail by an expert. A Samivel anthology like you have never seen before. In 1713, the Utrecht treaty put an end to the war of succession in Spain and signalled profound changes among the European states. In the southern Alps, this event, which introduced the concept of « natural borders », did not go over easily. The Musée Dauphinois in Grenoble has created a remarkable exhibition presenting the photo collection of the Flandrin family (1840-1940) that explains the context, over the first century of photography, of the works produced by these pioneers in Alpine imagery. With Lou, her very young daughter, Mariette Nodet travelled to discover the nomadic shepherds and the lights of the Little Pamir, a valley surrounded by high mountains, located between Afghanistan, China, Pakistan and Tajikistan. The pages of a book and a travel log await here, in an act of love.